South African emergency centres witness high levels of trauma. Successfully managing a compromised trauma airway requires considerable skill and expertise. In the rural healthcare setting, clinics and hospitals are often staffed by junior doctors without formal advanced airway training. Current airway management algorithms tend to ignore lack of resources and skill. We therefore propose a simplified guideline for the rural hospital practitioner. Our algorithm offers a step-by-step approach, with the aim of providing an easy sequence to follow that will ensure successful airway management and patient safety. The paucity of advanced airway equipment in most rural hospitals is taken into consideration. South Africa (SA) is a middle-income country characterised by high levels of trauma. Road traffic accidents and interpersonal violence are common. This situation is fuelled by rapid urbanisation as well as socioeconomic disparities. The injury burden typically peaks over weekends and on paydays and public holidays. Consequently, many emergency centres are inundated with victims of blunt and penetrating trauma. The annual estimated trauma incidence in KwaZulu-Natal (KZN), the most populous province in SA, is 12.9/1 000 population. Comparing these figures with European data, e.g. for London, UK, where the incidence of trauma is around 0.5/1 000, clearly demonstrates the high trauma load in SA. Many trauma patients in KZN present outside urban centres to facilities that are often basic and frequently understaffed. The skill sets of hospital staff vary significantly, with many smaller hospitals commonly relying on inexperienced junior doctors with minimal training and equipment to manage all aspects of major trauma. Ensuring that the airway is patent and protected is the most crucial initial intervention in the treatment of trauma patients. The management of the trauma airway can be hugely challenging, and differs significantly from airway emergencies encountered in the operating room in an elective setting. Haemodynamic instability, time pressure, risk of aspiration, the need for cervical spine protection, penetrating neck trauma and facial injuries represent some of the issues that make trauma airway management difficult. Moreover, for similar reasons it is rarely possible to assess the airway comprehensively in an attempt to predict potential difficulties and prepare accordingly. Dealing with such situations requires a level of clinical experience that is often not available in the rural hospital environment. Guidelines presented by the Emergency Medicine Society of South Africa (EMSSA), the Difficult Airway Society (DAS) in the UK and the American Society of Anesthesiologists (ASA) are comprehensive and provide many useful pointers on how to deal with these situations. [7-9] Nevertheless, useful as these guidelines are, in our opinion they fail to address a number of fundamental issues. Finally, supraglottic airway (SGA) devices should be used much earlier and play a key role in rescuing the emergency trauma airway in the hands of inexperienced staff. Initiating bag-mask ventilation or other airway adjuncts prior to using an SGA when oxygenation and ventilation are compromised makes little sense in our opinion, particularly since face-mask ventilation is often done poorly in an emergency situation, increasing the risk of gastric insufflation and pulmonary aspiration. We therefore suggest a single-page practical management guideline taking the above challenges into account. Since the safety of the patient is paramount, the aim is to provide clear guidance to ensure gas exchange in situations where a junior doctor with limited experience is faced with managing the trauma airway. 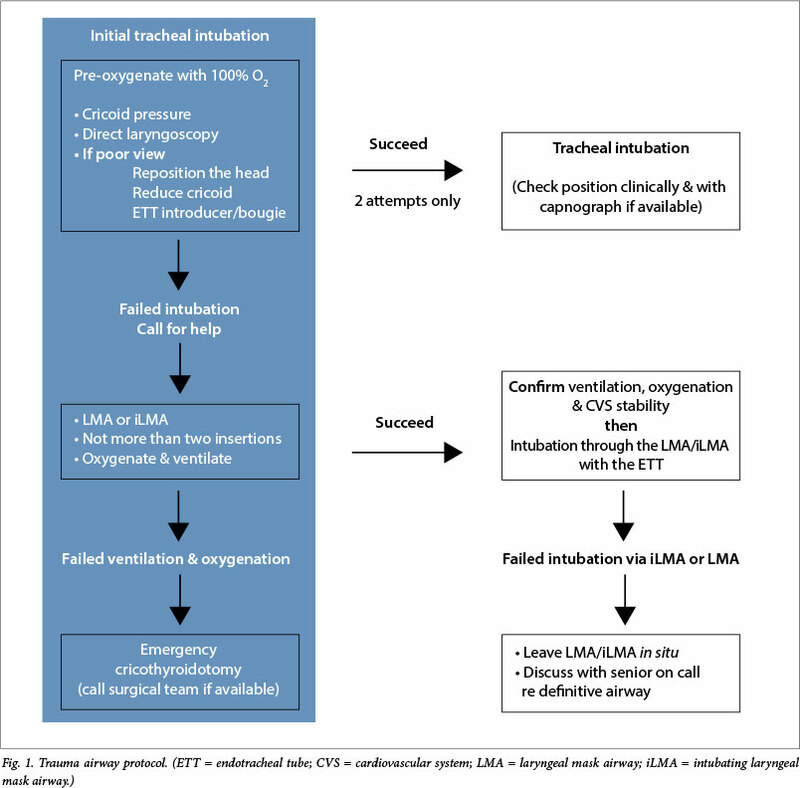 Our protocol is primarily a modification of the emergency airway management algorithm used at the Shock Trauma Center (STC) of the University of Maryland (Baltimore, USA), as well as incorporating elements of the EMSSA protocol. [7,12] It is a simplification of these guidelines and adapted for use in the rural hospital trauma setting, in a situation where loss of the airway is imminent and the option to reverse the anaesthetic, as well as awaken the patient, is not possible. The protocol takes into account that the operator may only have basic skills. Aware that equipment is often rudimentary, we elected not to include adjuncts more advanced than a bougie, SGA devices and tracheostomy tubes. We designed our algorithm seeking procedural simplicity and utilising minimum recommended equipment for an emergency centre, as suggested by EMSSA. The algorithm is illustrated in Fig. 1 and provides a step-by-step approach to managing a compromised trauma airway in the rural healthcare setting. In opting for visual clarity, we used a single-page layout with a simple three-step approach (intubation - rescue device - surgical airway) outlined on the left-hand side of the page. The decision tree in our guideline is limited to two branches, which greatly reduces the number of decisions that a doctor needs to make in a stressful situation, allowing it to be used at the patient's bedside in an emergency. A similar three-step approach is integral to the STC protocol and has been validated in a study of 6 088 emergency trauma intubations over a 10-year period. This retrospective survey, the largest reported, confirms an overall high success rate, with no patient dying of a hypoxic cardiac arrest during airway management. Of note, a mere 21 patients required an emergency cricothyroidotomy or tracheotomy. Despite obvious limitations to this study (retrospective, specialist trauma centre, resource-rich setting), the results are compelling. In keeping with other international airway guidelines we have purposefully not included a description of anaesthetic induction agents, or indications or preparations for an RSI. [8,9,12] Such additional information would crowd the algorithm unnecessarily and would be counterproductive in achieving clarity. A discussion of the various RSI drugs is best dealt with in a separate guideline. Calling for help remains an integral part of all emergency airway algorithms. However, in the SA context rural hospitals frequently have only one doctor on site after hours, with limited senior support. We have designed our protocol with this in mind. Should the primary intubation attempt fail, rapid use of an SGA device can be life saving. Although not a definitive airway, an SGA is easy to insert and can improve the patient's gas exchange. SGAs can also be used as a conduit for intubation if the operator feels confident enough, particularly with the intubating laryngeal mask. [8,11,12] It is therefore our view that given the precarity of the skills on the ground and the clinical condition of these patients, an SGA is life saving. [6,12] The aim should be oxygenation and ventilation with the final endpoint of a safely inserted secure airway. While emphasising the need for technically simple interventions, the proposed algorithm includes a surgical airway as a last resort. Unfortunately, it is a skill that most doctors will have very little opportunity to practise. Nonetheless, it remains a vitally important intervention that all doctors dealing with emergency airways need to be prepared to carry out. If SGA placement is not successful, an emergency cricothyroidotomy or tracheotomy is performed immediately in order to secure the patient's airway. Management of the emergency trauma airway is difficult. As pointed out, haemodynamic compromise, cervical immobility, direct airway trauma, oropharyngeal bleeding and the need for immediate action all complicate airway management. [6,11] Trauma patients who need an emergency airway intervention require rapid and decisive decision-making in the face of incomplete information and management via a preplanned airway algorithm that includes rescue techniques in the event of failure. Despite many useful publications in the literature, there seems to be an absence of concise, practical point-of-care guidelines to the lowest common denominator, i.e. the junior doctor. [6-9] We hope that our emergency airway protocol addresses some of these shortcomings and assists junior doctors to provide the best care possible for trauma patients under difficult circumstances. We urge SA medical bodies to consider this algorithm, designed for rural healthcare practitioners with minimal experience, when drawing up future guidelines on airway management.